It wasn't enough for felonious Ponzi patriarch Bernard Madoff to bilk his clients of over $60 billion in assets. Now, the jailbird stock swindler is trash-talking about the very federal authorities who should have caught him and stopped the largest financial scam in history. In a jailhouse interview released late Friday by H. David Kotz, the Securities & Exchange Commission's inspector-general, Madoff disses SEC investigators as bumbling bureaucrats and says he was "astonished" that no one caught him earlier. "It would have been easy for them to see," Madoff said of the clueless financial cops who failed to perform what he called "accounting 101." The interview was among more than 6,000 pages of assorted documents Kotz released on Friday that he has collected during his investigation of years worth of the SEC's Madoff-related actions. The young government investigators failed to check such basic information as Madoff's account with Wall Street's central stock-clearing office, not to mention his dealings with the companies that supposedly handled his fictitious trades, the Ponzi master said. 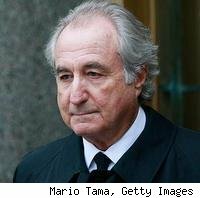 "If you're looking at a Ponzi scheme, it's the first thing you do," Madoff said during the the June 17 jailhouse interview. "It never entered the SEC's mind that it was a Ponzi scheme." If it had, Madoff asserted, the SEC could have easily uncovered what turned out to be the largest such financial fraud in history and a black eye for the regulatory commission charged with monitoring and stopping exactly such crimes. Instead, SEC examiners relied on Madoff's word -- which turned out to be worth mud -- and other materials he provided, which also were fabricated. Despite the commission's ineptitude, Madoff said he "was 'worried every time' he was examined or investigated by the SEC, and that 'it was a nightmare for me' because 'it was very basic stuff.' That was the nightmare I lived with." Madoff's fraud cost many people their life savings, pensions and even homes. He was arrested in December, pleaded guilty in March and is now serving a 150-year prison term in North Carolina. In the interview, Madoff dissed one of the SEC sgents as an "obnoxious guy" who came across like "Lieutenant Colombo" -- Peter Falk's famous, if flaky, TV investigator -- and spent 90 percent of his time checking Madoff's e-mails. Madoff also described current SEC Chairwoman Mary Schapiro as "a 'dear friend' and that she 'probably thinks I wish I never knew this guy.'" However, this appears to be a yet another Madoff make-believe: Inspector General Kotz, in a statement on Friday about the documents he released, said he found no evidence that Madoff had a close friendship with Schapiro. Demonstrating that his elevated sense of his own status on Wall Street has remained intact, Madoff suggested that regulators went easy on him thanks to his prestigious posts at various Wall Street institutions, including serving as chairman of the Nasdaq exchange. "I'm very proud of the role I played in the industry," Madoff told Kotz. "Of course, I destroyed that now," the Ponzi prince, said, in the understatement of the year. The interview summary was among 536 exhibits of interviews, letters, e-mail messages and phone records -- released yesterday. These documents formed the basis of Kotz's September report that first placed blame on the SEC for failing to uncover the massive fraud. Other exhibits released include transcripts of testimony by SEC staffers, in which they absolutely unload on their own employer and rip colleagues as incompetent. SEC investigator Kotz was highly suspicious of the relationship between former SEC attorney Eric Swanson, whose group had oversight of Madoff's trading, and Madoff's niece, Shana, the documents show. They're now married. According to court-appointed trustee Irving Picard, Madoff's crime cost thousands of victims, including individuals, investment funds and charities at least $21 billion in cash, as part of the $65 billion in paper wealth that he's accused of ripping off. David Friehling, Madoff's accountant from 1991 to 2008, is expected to plead guilty on Tuesday as part of a deal with the government, federal prosecutors said Friday. Picard has already filed a $199 million lawsuit against the disgraced financier's sons Andrew and Mark, his brother Peter and his niece Shana, alleging that they benefited from Madoff's epic fraud by using his investment firm as a "family piggy bank" to fund their lavish lifestyles. Bernard Madoff's current lifestyle is stark proof of how dramatically their living conditions could change.